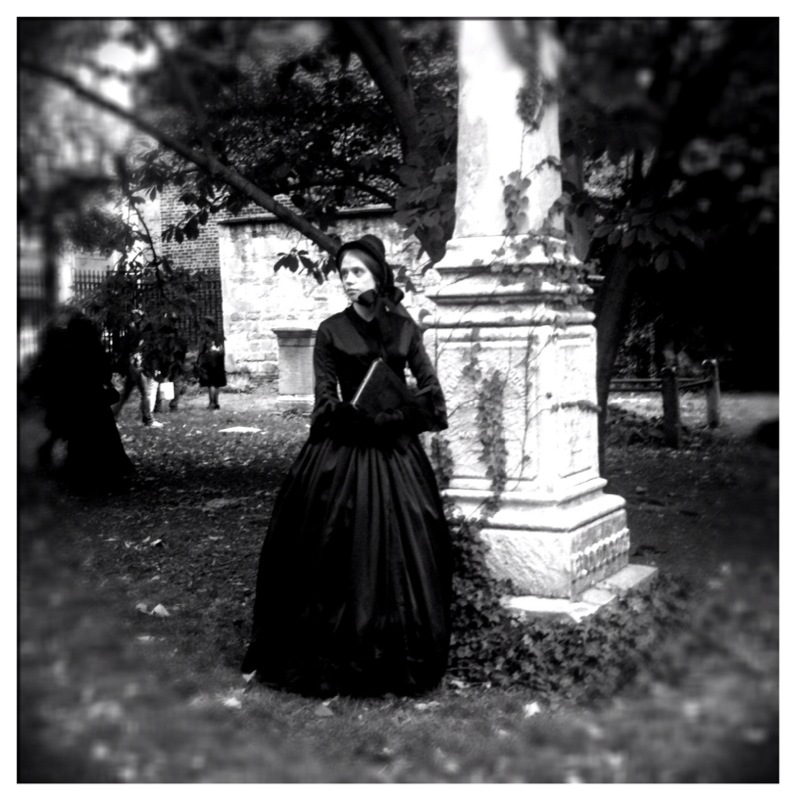 A few years ago, I made a dress to wear to the faux 19th-century funerals that I host (does one host a funeral?) every year for the museum where I work. 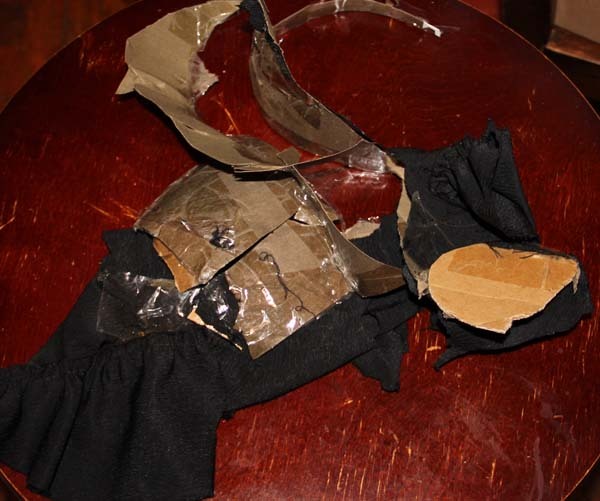 I spent weeks on the dress, crape-trimmed undersleeves, and crape-trimmed chemisette. But I didn’t think of making a bonnet until the night before the funeral. 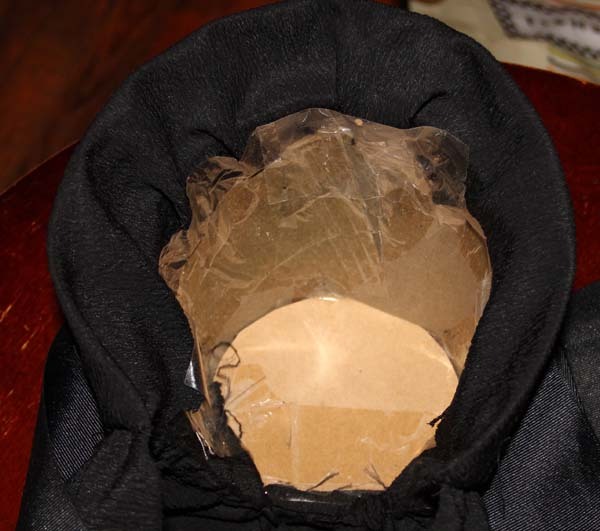 With no millinery supplies on hand, and just an hour or two until showtime, I scrounged around and made do. Not bad, considering it’s made on a frame of…wait for it…two hanging file folders and packing tape. It made crinkling sounds whenever I put it on, but no one ever discovered my secret. Unless I told them of course…which I did with great pride in my own ingenuity. 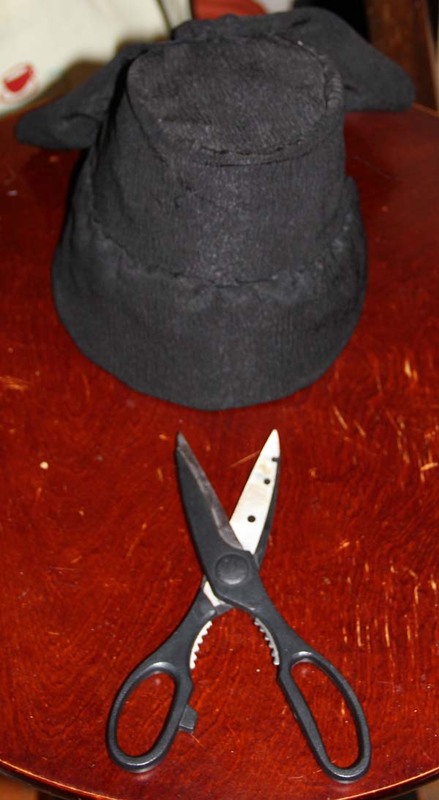 So tonight, realizing that I would never again run a faux funeral (yeah, yeah, never say never — but at least not for a while), I decided to kill my bonnet in a symbolic gesture. 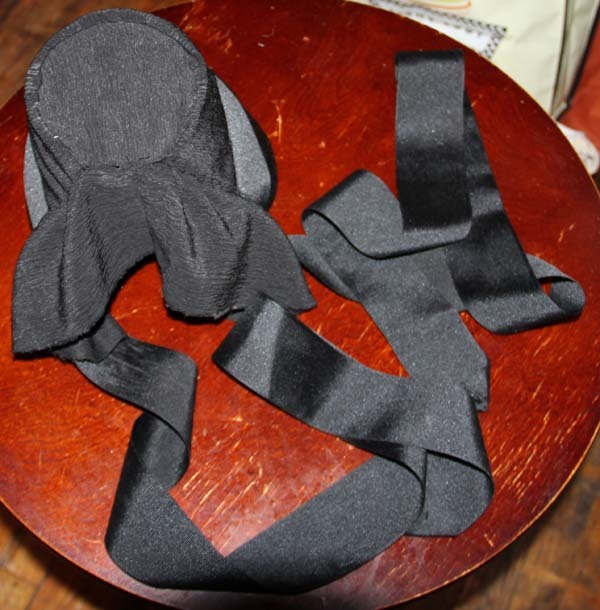 First I took off the ribbon though, which actually belongs to my Elvira Madigan dress (that’s what my husband calls it). Then I took up my sacrificial blade. It was surprisingly satisfying to tear apart my work. So, it is with a sombre, yet satisfied, heart that I bid adieu to my make-shift mourning bonnet. 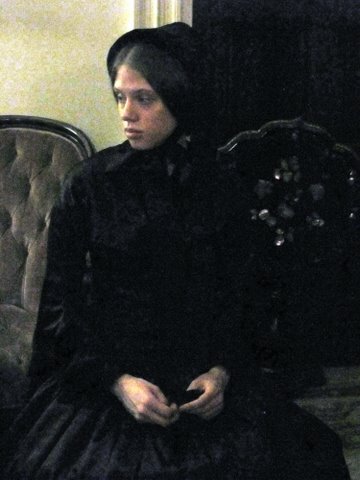 Gosh, it seems like I am forever pretending that I lived in the mid-19th century and one of my relatives just died. I was at it again yesterday, as we all pitched in to help artist Hal Hirshorn stage the first of three photo shoots in preparation for an upcoming show that I’m curating. This digital snapshot was taken by one of the other models (there were 7 in total, plus a fake corpse and a coffin). A couple of weeks ago, I was interviewed at work by George Bodarky for his Cityscape program on WFUV radio in New York City. The title of the show was The Inevitable, and guests included the obituary writer for the New York Times, a representative of the legendary Greenwood Cemetery, and me. It seems I have become something of an authority on death and funerals in mid-19th century New York. If you care to listen, here’s a link to the show page. Why, you ask, do I know so much about death? 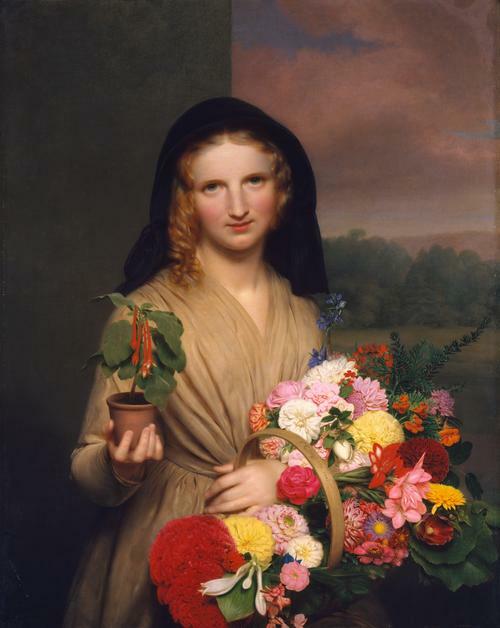 Mostly, it’s because we host an annual exhibition about death and mourning every October at the Merchant’s House Museum. We also recreate a mid-19th century funeral, complete with corpse (faux), coffin (reproduction), and a tour of the New York City Marble Cemetery. That’s where the talented Stephanie Swinton snapped this photo of me posing with an obelisk. 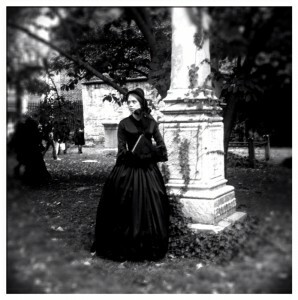 I attended the Nineteenth Century Pub Crawl on Saturday, October 2. 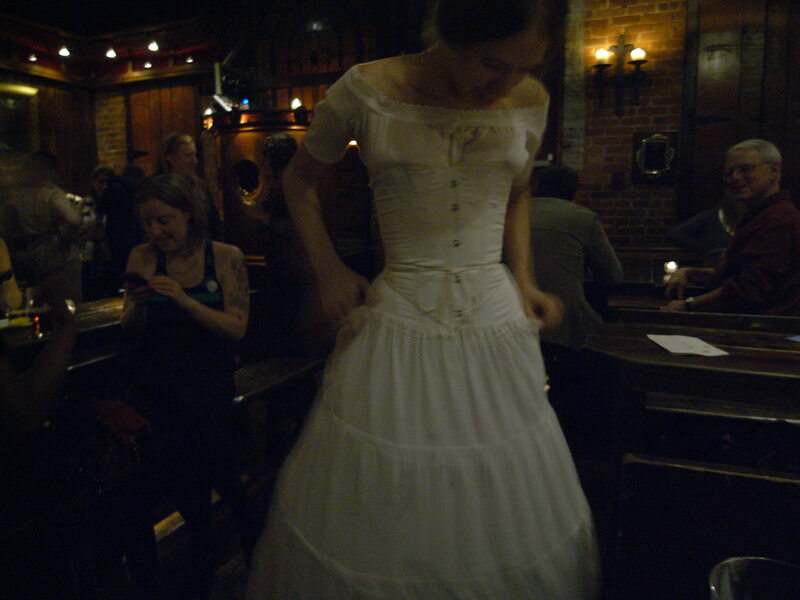 Period dress was encouraged, so I wore my one and only (to date) 1850s dress with assorted undergarments. 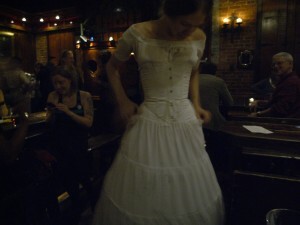 The corset was especially ill-fitting, and by the second bar (Swift Hibernian Lounge), I was in grave discomfort. So I stripped.